Reeves Center Acquires 16th-Century Italian Vase The vase, which was made in the city of Deruta, illustrates two main influences on European ceramic design. This 16th-century Italian vase, newly acquired by the Reeves Center at W&L, illustrates two main influences on European ceramic design. From the Renaissance until today, there have been two main influences on European ceramic design: design inspired by ancient Greece and Rome, and design inspired by Asia. This vase, made in Italy between 1510 and 1540 and newly acquired for the Reeves Collection, shows both. The vase is made of Italian maiolica, a brightly colored tin-glazed earthenware made in Italy in the 15th and 16th centuries. 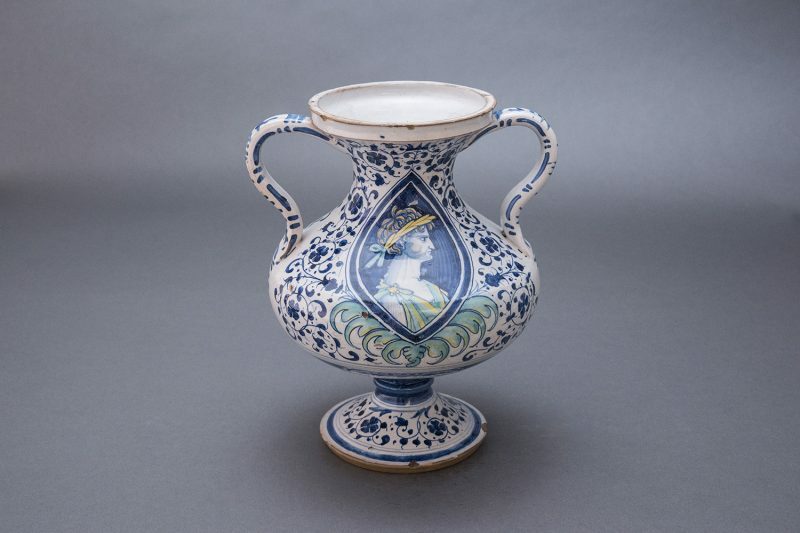 Inspired by tin-glazed earthenware vessels made in the Middle East and Islamic Spain, maiolica was named for the Mediterranean island of Majorca, through which Spanish tin-glazed earthenware was exported to Italy. Maiolica was bought by wealthy and sophisticated consumers throughout Italy, ranging from merchants to princes and popes, and was exported as far afield as Germany and England. 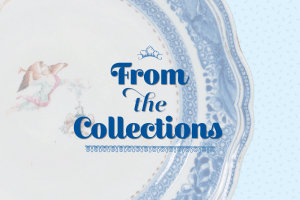 It was meant to be used, either for dining (the most common form found in maiolica are plates) or for display. Our vase would have originally had a cover, and was probably used to decorate a sideboard during a grand banquet. While not nearly as famous as painting, sculpture or architecture, Italian maiolica is, according to the art historian Timothy Wilson, “at its most ambitious … a serious form of Italian Renaissance art.” As the leading scholar of the subject, he may be biased, but Italian maiolica reflects many of the main traits of the Italian Renaissance: the revival of interest in the art and culture of ancient Greece and Rome, new global trade networks that moved objects and design motifs around the world, and a growing sophisticated, urban elite with the wealth and interest to commission luxury objects for both religious and secular use. Our vase was made in the city of Deruta, near Perugia in Umbria. Deruta was famed for its maiolica, and had between 30 and 40 workshops active in the first half of the 16th century. The vase is attributed to one of Deruta’s leading potters, Nicola Francioli (who was also known as “Co” and was active from at least 1513 to 1565), based on similarities between it and a tiled pavement in the church of San Francesco in Deruta that he made in 1524. The bust portraits were probably inspired by ancient Roman coins and cameos. Francioli would have drawn on a number of different sources for his designs. The bust portraits were probably inspired by ancient Roman coins and cameos, which were avidly collected by Renaissance connoisseurs. Such imagery would have been readily available, either through the coins or cameos themselves, printed images in books, or drawings or paintings by artists. Among these was the painter Pinturicchio, from the nearby city of Perugia, several of whose paintings were copied on maiolica, and whose portrait medallions on the ceiling of the Palazzo della Rovere in Rome resemble those on this vase. The alla porcellana decoration was inspired by 15th-century Chinese blue and white porcelain. 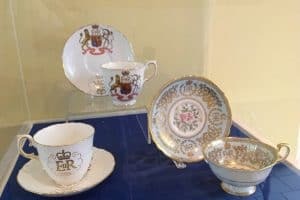 Chinese porcelain was fabulously rare in Europe at the time, owned only by the wealthiest and most well-connected people. It was prized for its white translucent body, its delicately painted decoration and its exotic origins, and potters strove to imitate its material and decoration. 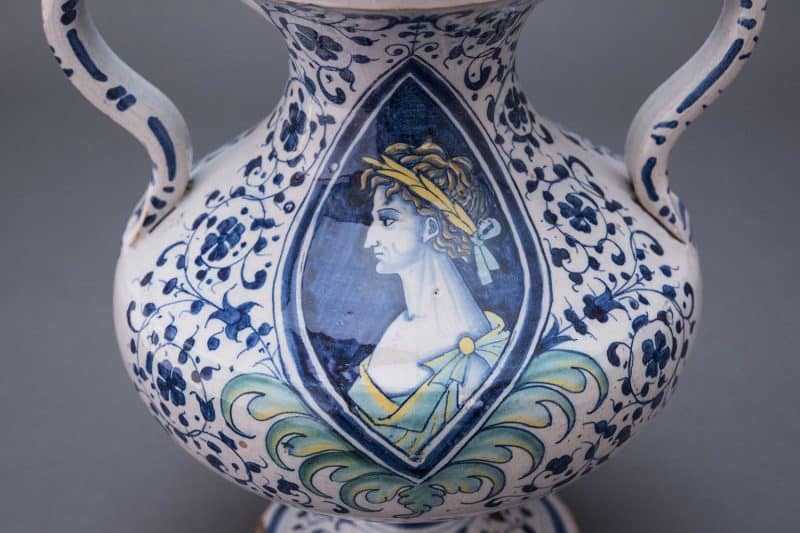 While it would take until 1708 for Europeans to figure out how to make the material itself, they quickly learned how to imitate its blue and white decoration; by the 1550s it was noted that alla porcellana was a “universal design” on maiolica. As an example of one of the earliest types of fine ceramic to have been made in Europe, and as an example of the earliest influence of Chinese porcelain on European ceramics, this vase is a perfect addition to the Reeves Collection, which is especially rich in Chinese export porcelain and European ceramics that were inspired by Chinese porcelain. The vase was bought with money from the W. Groke Mickey Acquisitions Fund, and is now on display in the Reeves Center.